This IMA Volume in Mathematics and its Applications Oscillation Theory, Computation, and Methods of Compensated Compactness represents the proceedings of a workshop which was an integral part of the 1984-85 IMA program on CONTINUUM PHYSICS AND PARTIAL DIFFERENTIAL EQUATIONS. We are grateful to the Scientific Committee: J. L. Ericksen D. Kinderlehrer H. Brezis C. Dafermos for their dedication and hard work in developing an imaginative, stimulating, and productive year-long program. George R. Sell Hans Weinberger PREFACE Historically, one of the most important prohlems in continuum mechanics has been the treatment of nonlinear hyperbolic systems of conservation laws. Thp. importance of these systems lies in the fact that the underlyinq equ~tions of mass, momentum, and energy are descrihed by conservation laws. Their nonlinearity and hyperbolicity are consequences of some cornmon constitutive relations, for example, in an ideal gas. The I. M. A. Workshop on "Osci 11 at i on theory. computat i on, and methods of com- pensated compactness" brought together scientists from both the analytical and numerical sides of conservation law research. The goal was to examine recent trends in the investigation of systems of conservation laws and in particular to focus on the roles of dispersive and diffusive limits for singularily perturbed conservation laws. 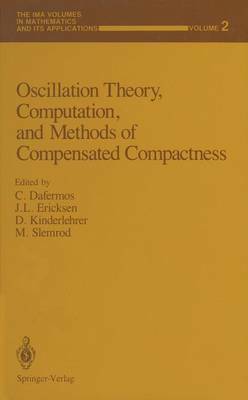 Special attention was devoted to the new ideas of compen- sated compactness and oscillation theory.